The scheme is located at Dunoon on the Cowal peninsula in Argyll and Bute, Scotland. The project involved significant marine works due to its location on the Firth of Clyde which encloses the largest and deepest coastal waters in the British Isles. The existing combined sewer network discharged largely untreated wastewater into the Holy Loch and Firth of Clyde and required a significant upgrade to comply with the Urban Waste Water Treatment Directive (Scotland) Regulations and satisfy Scottish Environmental Protection Agency (SEPA) guidelines for discharges into recreational waters. The new scheme is designed for a population equivalent of 14,465, which includes a significant seasonal allowance for visitors in this popular seaside tourist area. Ward & Burke designed, constructed, tested and commissioned the project which consisted of 3Nr. 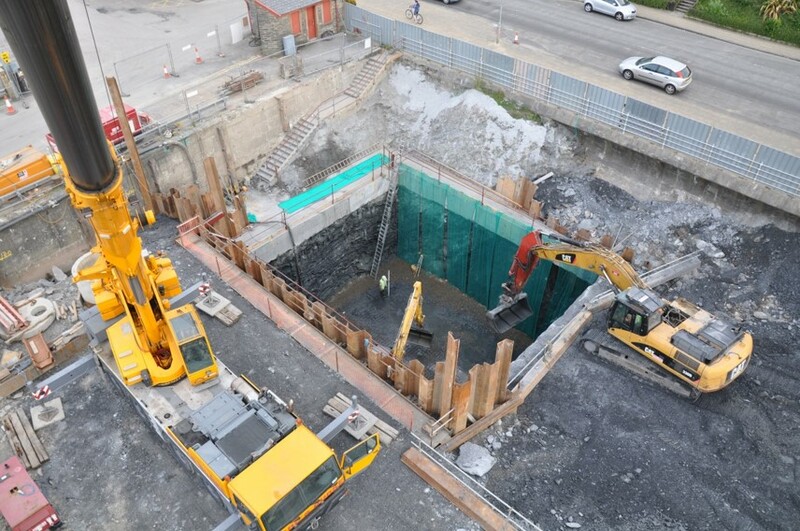 concrete structures (West Bay Pumping Station, East Bay Pumping Station and Jim Crow CSO Chamber & Retaining Wall), 534m of 1200mm & 600mm micro-tunnels, 500m open-cut pipelines and site works at the structure locations, all of which were located on the foreshore area. Ward & Burke proposed an alternative design for the West Bay storm storage tank/pumping station, which was constructed as a single elliptical shaft design (major axis 25m, minor axis 15m, depth 15m) incorporating a dry well, which made efficient use of the limited space available adjacent to the promenade. Reduce risk of heave when the bottom of the caisson met rock on road side. Piles went out of plumb when installed using Movax so special tapered pile made to correct out of plumb sheet piled wall. East Bay consisted of a partially piled cofferdam where the rock profile dropped. 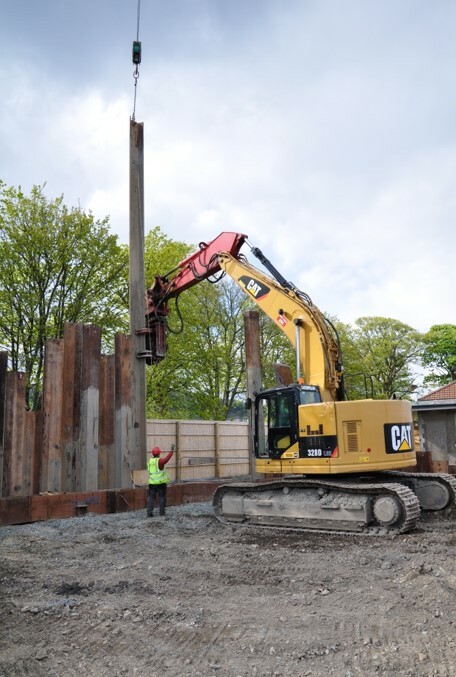 Ward & Burke used robust RC Waler to stabilise rock and support piles. 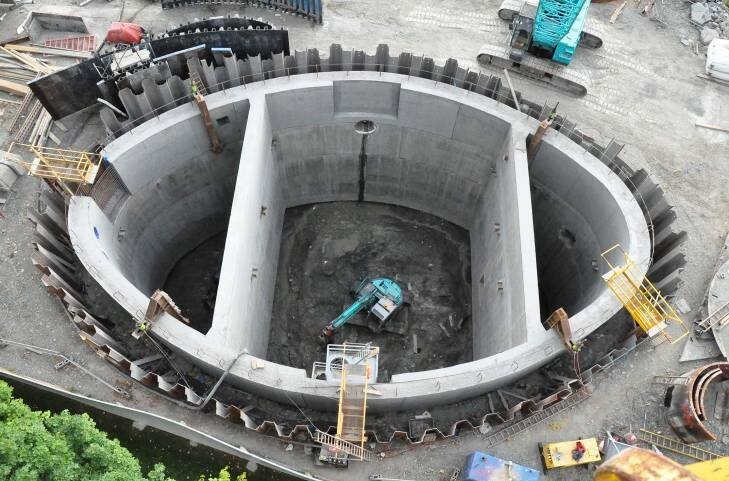 West Bay elliptical shaped caisson shaft was designed to deal with the existing site constraints of: sea wall; high pressure gas main; existing building; site geology of marine deposit overlying mudstone rock; and storage capacity requirements. It represented an alternative to the design proposed by the Client consisting of two circular segmental ring caisson shafts. 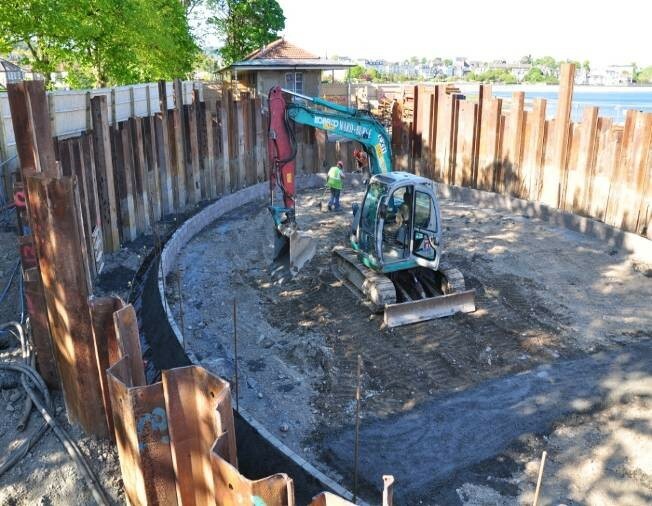 This design solution successfully overcame challenges posed by the existing site constraints in the marine environment including a sea wall, high pressure gas main, existing buildings and the challenging site geology of marine deposits overlying mudstone. The proposal catered for the required storage capacity requirements and was an alternative to the design proposed by the Client which had consisted of two circular segmental ring caisson shafts. 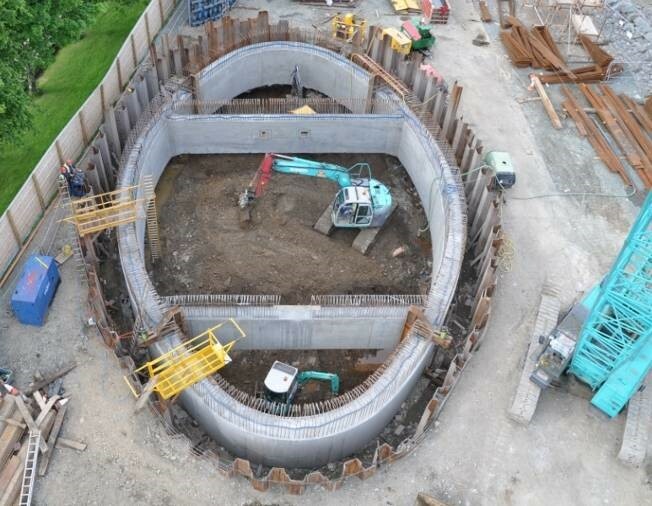 In-situ concrete lifts were poured and lowered every two weeks, giving a 12-week construction programme for the tanks and therefore halving the programme time for the installation which would have been required with the client’s original proposal.